I use Grammarly for proofreading, because knowing the language of language is totally meta. 1// Let the manuscript rest for a few days after you’ve finished your last draft. Take some time to go read a book for pleasure or take a hike. Cook. Clean. Spend time with family and friends. Do anything except polish your manuscript. When you’re ready to dive back in, you’ll have fresher eyes. 2// When you do sit down to crank out your final proofreading, polishing, and personal edits, grab a bowl of chocolate, pumpkin seeds, or popcorn (whatever floats your boat) and make sure it is within reach at all times. Polishing is monotonous and little pieces of edible flair are always appreciated. Trust me. 3// Take frequent breaks. Stand up and stretch. Do not try to do the entire manuscript in one sitting (likely impossible anyway). 4// Don’t be afraid to look up grammatical questions. The internet is a vast, vast place with plenty of accurate language knowledge (if you know where to look). 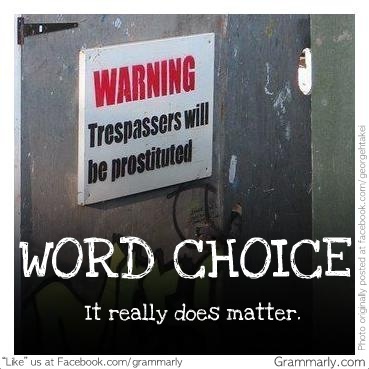 I’m still laughing about this image…Seriously, folks, Grammarly’s Facebook page and Pinterest boards have so many awesome images like this. What are your own steps when it’s time for you to tackle your final draft? I’d love to hear your approach! Ever used Grammarly or something similar? What was your experience? Do comment and share!